As Director of Marketing and Communications at the Dayton Area Chamber of Commerce, Holly Allen oversees the overall branding of the chamber, as well as communication with its members. Holly leads the creation of the Chamber Connection, the chamber’s weekly e-newsletter, Business Connections, the chamber’s monthly TV show, and FOCUS on Business Magazine. Holly works to promote chamber events and initiatives and works closely with local media outlets to ensure the Dayton region’s business community has a voice. Holly came to the chamber from WDTN-TV in October 2014. There, she served as anchor of “2 NEWS Today” and reported on Dayton-area news stories, earning an Enterprise Reporting and two Broadcast Writing awards from the Associated Press in 2011 and 2012. Holly has also reported for KVRR-TV in Fargo, North Dakota, WIPB-TV in Muncie, Indiana and the Post and Mail in Columbia City, Indiana. 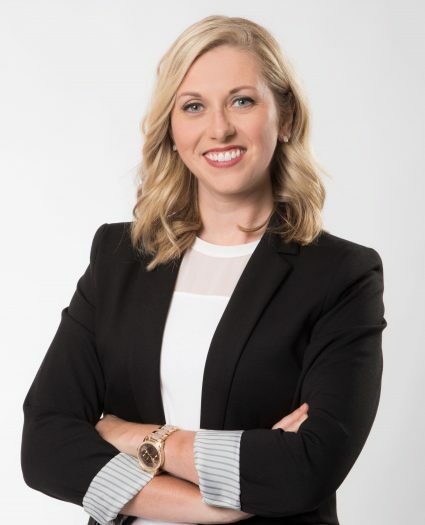 Holly was named one of the Dayton Business Journal’s “Forty Under 40” in 2015, is a 2016 graduate of Leadership Dayton and a member of the American Society of Association Executives, the Public Relations Society of America, and the Association of Chamber of Commerce Executives. She is also actively involved in several area non-profits including Muse Machine and Ronald McDonald House Charities of Dayton. Holly earned a BA in Telecommunications with a news focus at Ball State University. She lives in Clearcreek Township with her husband Greg and two daughters.